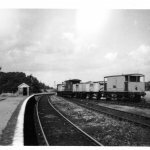 This lengthy train included 7 open wagons and guards van heading towards Havant. 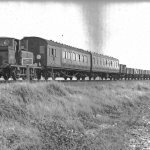 With the imminent closure of the Hayling branch line, the regular mixed train was used to remove the goods vehicles from Hayling Station goods yard. This train was the 14:58 train to Havant. 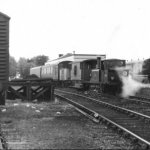 Ref 313 14 Oct 1963 This lengthy train included 7 open wagons and guards van heading towards Havant. 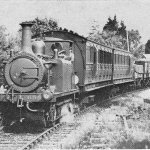 With the imminent closure of the Hayling branch line, the regular mixed train was used to remove the goods vehicles from Hayling Station goods yard. This train was the 14:58 train to Havant. The 2.58pm up mixed train being prepared at Hayling Island on 26 August 1963. 32650 in charge.